Some reviews are harder to write than others. For the first 300 or so pages of Theft of Swords, I was sure I knew what I would write, and that much of it would be critical. But then an odd thing happened: the book changed. It changed so much, and was so successful in its new direction, that I realized a rethink was in order. Here's why: Theft of Swords isn't actually the first entry in the broader Riyria Chronicles, but the first two collected in one volume. Both The Crown Conspiracy and Avempartha were originally self-published. Apparently these, and their sequels, sold over 90,000 copies, leading to requests for translations and renewed interest from the New York publishing houses. A contract with leading SF/F imprint Orbit Books resulted. So what does all this tell us, potentially? Well, for one thing it shows that self-publishing can be a viable platform from which to launch a career. Maybe not for everyone, or even for most would-be authors, but in some cases it clearly is. Hopefully Sullivan will sit down with us someday and tell us how he did it. The way in which Sullivan grows as a writer from The Crown Conspiracy to Avempartha also suggest that self-publishing could be an audition of sorts, and some publishers at least may follow Orbit's lead, letting authors with not-yet-realized potential hone their skills in the self-publishing arena before committing a deal to them. More than anything, though, the marked improvement from the first to the second installment really drove home the point that you shouldn't really judge a book until you've read the whole thing. 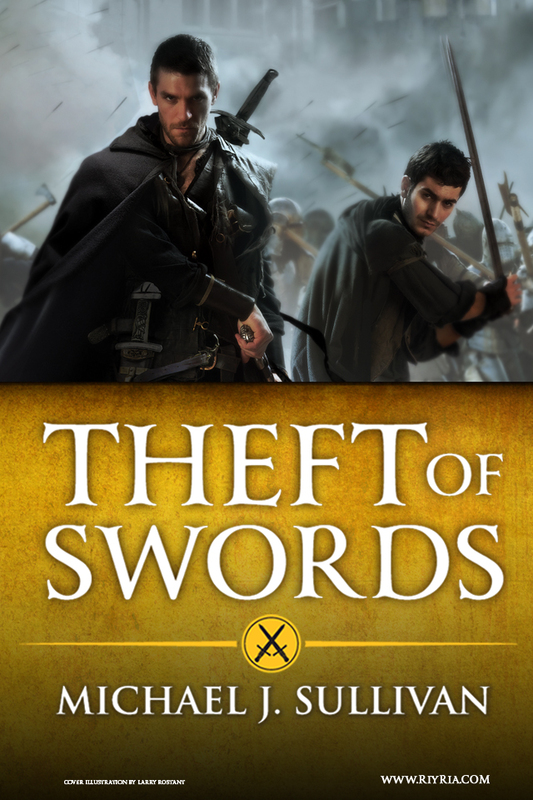 Theft of Swords takes place in a more traditional fantasy world than we typically find these days. There are elves, dwarves, wizards, gods and prophecies, and there are clear "good guys" and "bad guys." But Sullivan adds some neat wrinkles to the Tolkienic formula. The elves and dwarves are real, but mostly offstage. There's only one wizard left, but he's 900 years old and has no hands. And it's an open question as to whether the gods are real or just mythological. As in GRRM's Song of Ice and Fire, the metaphysical and mythical exists as a backdrop that slowly reveals itself to be more real than we might first think, given the limited knowledge and experiences of our narrators. This is something I liked from the get-go. Sullivan also introduces us to three political factions: the Royalists, who like the status quo; the Nationalists, who want some form of popular sovereignty; and the Imperialists, who want a return to the glory-days of yesteryear. The idea is interesting, but falters in execution. The Nationalists (when they are mentioned at all) are just too good--and this despite a clear lesson from real world history that nationalism is Janus-faced. The Royalists, for that matter, are just too fair-minded--though we know that power corrupts and hereditary rulers are often arbitrary and cruel. And why are they so sympathetic to the Nationalists?! After all, we know from our own history that nothing strikes fear into the hearts of the privileged like regular folks calling for a bigger slice of the pie. The Imperialists, and the Church of Nyphron that supports them, on the other hand, are just too blatantly evil. Throwing a bit more gray and nuance into the pot would have added, rather than taken away, from the effectiveness of the setup. Hopefully that comes later in the series. Action centers on two rogues: master sword fighter Hadrian Blackwater and master thief Royce Melborne. At first glance they seem like Fahfrd and the Grey Mouser clones, but Sullivan does a good job differentiating them from their antecedents, and in the process has created two very likable, relatable protagonists. And in the wizard Esrahaddon, Sullivan has his Gandalf (though thankfully the character is nothing like Gandalf). Unfortunately, The Crown Conspiracy is beset with problems that limited my ability to enjoy the things it does well. The plot itself isn't bad--master thieves framed for a crime they didn't commit, end up major players in a conspiracy to steal the crown from its rightful heir. But the mechanisms that move the plot forward are either too convenient or just plain inexplicable. What's more, the "evil" characters have a tendency to launch into Legion of Doom-style soliloquies where they reveal the supreme evilness of their dastardly plans. Finally, there's an unfortunate tendency to world-build through infodumps that read like encyclopedia entries and shatter any suspension of disbelief you might have built up in the preceding pages. A part of me considered stopping there, but I'm really glad I didn't. The thing is, as much as all this bothered me, I still saw a lot of potential in the characters and the world of the Riyria Chronicles. With Avempartha, Sullivan begins to realize that potential. I attribute a good portion of the improvement to a shift in focus from epic fantasy on a grand scale to more intimate sword & sorcery, which the characters are better suited to. But there's also markedly better writing as well. There are still a few too many infodumps early on, but after the first couple chapters they've pretty much disappeared altogether. Exposition is done through perspective, which is not only more pleasant to read, but helps flesh out the unique perspectives of the characters as well. There are some major reveals, and Sullivan is clever in how he handles them. The baddies still feel the need to shout about their badness a bit too much, but we begin to see a more complex morality at work, particularly with regards human-elvish relations. I found this very compelling, and look forward to seeing how Sullivan fleshes it out in subsequent volumes. While Avempartha doesn't reach the literary heights of Wolfe or Sapkowski, it does present the reader with an engaging and fun take on the Tolkienic tradition, and can be quite thought-provoking at times as well. I was left eager to see how things play out in the next volume, Rise of Empire, and that's a good measure of success in a fantasy series. Penalties: -1 for excessive infodumping; -1 for problematic plot twist mechanisms in The Crown Conspiracy; -1 for "have I told you that I am evil?"